Not to be confused with United States Senate election in Pennsylvania, 1861. 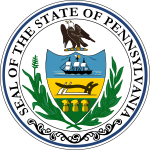 The 1861 United States Senate special election in Pennsylvania was held on March 14, 1861. David Wilmot was elected by the Pennsylvania General Assembly to the United States Senate. ^ a b "U.S. Senate Election - 14 March 1861" (PDF). Wilkes University. Retrieved 23 December 2012. ^ "CAMERON, Simon, (1799 - 1889)". Biographical Directory of the United States Congress. Retrieved 23 December 2012. ^ "PA US Senate - Special Election". OurCampaigns. Retrieved 22 December 2012.